Most people change jobs and employers several times over the course of their careers. Those who participated in their employer's sponsored retirement plans, like a 401(k) or a SIMPLE IRA, are then faced with figuring out what to do with those assets when they move on. Employees have several options when it comes to 401(k) assets that are with a former employer's plan. They can leave the assets in the plan or move them into a rollover IRA or a new employer's qualified retirement plan. But the rules are slightly different for SIMPLE IRA assets. These rollovers are time sensitive. A Savings Incentive Match Plan for Employees (SIMPLE) IRA is something of a cross between a traditional IRA and a 401(k) plan. The contributions you make to the plan are always yours, and your employer can make contributions to a SIMPLE IRA on your behalf. These types of plans are a great option for small businesses with fewer than 100 employees. 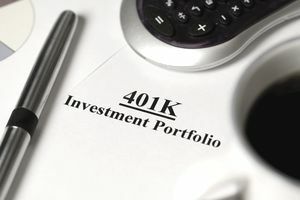 You would normally pay income tax on withdrawals you take from your plan, but you can avoid this if you roll your SIMPLE IRA into a 401(k) when you leave your employer. Your age isn't a factor, either, because the rollover is not considered to be a withdrawal. You would usually pay a 10 percent penalty if you take withdrawals before you reach age 59 1/2 unless you qualify for certain exceptions, but this is waived as well if the transfer conforms to IRS guidelines for a rollover. Rolling over your SIMPLE IRA assets to a rollover IRA or a 401(k) isn't an extremely complicated process, but you'll want to make sure that you complete the rollover within the terms of your SIMPLE IRA plan and that you meet IRS rules as well. This ensures that the rollover qualifies as a penalty-free and tax-free trustee-to-trustee transfer. Your SIMPLE IRA must be in place for at least two years to qualify. The clock begins running from the date you first participated in the plan, not the date you left your employer. You'll dodge a significant penalty if you wait out the two years because the rollover is otherwise considered to be a withdrawal. That 10 percent penalty you'd pay if you're younger than 59 1/2 increases to 25 percent if you roll over your SIMPLE IRA within the first two years, unless you qualify for an exception. Changing jobs is not considered an exception unless you use the funds to pay for health insurance while you're unemployed rather than move the funds over into another plan. You'll have to include the withdrawal in your taxable income for that year as well if you haven't participated in the plan for at least two years. The 2-year rule applies to rollovers to Roth IRAs as well, but with one additional wrinkle. Any portion of the plan that represents untaxed income to you must be included in your income when you file that year's tax return. You're free to transfer any amount from one SIMPLE IRA to another SIMPLE IRA in a tax-free trustee-to-trustee transfer at any time. The IRS does not make you wait two years to make this kind of transfer.